operations include powerline patrol, electromagnetic survey, agricultural spraying, livestock herding, police/radio traffic watch, emergency medical service/rescue, and movie or television support flights. a. LTE is a critical, low-speed aerodynamic flight characteristic which can result in an uncommanded rapid yaw rate which does not subside of its own accord and, if not corrected, can result in the loss of aircraft control. b. LTE is not related to a maintenance malfunction and may occur in varying degrees in all single main rotor helicopters at airspeeds less than 30 knots. LTE is not necessarily the result of a control margin deficiency. The anti-torque control margin established during Federal Aviation Administration (FAA) testing is accurate and has been determined to adequately provide for the approved sideward/ rearward flight velocities plus counteraction of gusts of reasonable magnitudes. This testing is predicated on the assumption that the pilot is knowledgeable of the critical wind azimuth for the helicopter operated and maintains control of the helicopter by not allowing excessive yaw rates to develop. (1) A helicopter collided with the ground following a loss of control during a landing approach. The pilot reported that he was on approach to a ridge line landing zone when, at 70 feet above ground level (AGL) and at an airspeed of 20 knots, a gust of wind induced loss of directional control. The helicopter began to rotate rapidly to the right about the mast. The pilot was unable to regain directional control before ground contact. (2) A helicopter impacted the top of Pike's Peak at 14,100 feet mean sea level (MSL). The pilot said he had made a low pass over the summit into a 40-knot headwind before losing tail rotor effectiveness. He then lost directional control and struck the ground. (3) A helicopter entered an uncommanded right turn and collided with the ground. The pilot was maneuvering at approximately 300 feet AGL when the aircraft entered an uncommanded right turn. Unable to regain control, he closed the throttle and attempted an emergency landing into a city park. a. On U.S. manufactured single rotor helicopters, the main rotor rotates counterclockwise as viewed from above. The torque produced by the main rotor causes the fuselage of the aircraft to rotate in the opposite direction (nose right). The anti-torque system provides thrust which counteracts this torque and provides directional control while hovering. b. 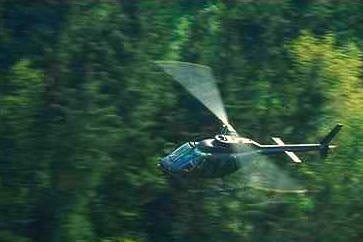 On some European and Russian manufactured helicopters, the main rotor rotates clockwise as viewed from above. In this case, the torque produced by the main rotor causes the fuselage of the aircraft to rotate in the opposite direction (nose left). The tail rotor thrust counteracts this torque and provides directional control while hovering. NOTE: This AC will focus on U.S. manufactured helicopters. c. Tail rotor thrust is the result of the application of anti-torque pedal by the pilot. If the tail rotor generates more thrust than is required to counter the main rotor torque, the helicopter will yaw or turn to the left about the vertical axis. If less tail rotor thrust is generated, the helicopter will yaw or turn to the right. By varying the thrust generated by the tail rotor, the pilot controls the heading when hovering. d. In a no-wind condition, for a given main rotor torque setting, there is an exact amount of tail rotor thrust required to prevent the helicopter from yawing either left or right. This is known as tail rotor trim thrust. In order to maintain a constant heading while hovering, the pilot should maintain tail rotor thrust equal to trim thrust. e. The environment in which helicopters fly, however, is not controlled. Helicopters are subjected to constantly changing wind direction and velocity. The required tail rotor thrust in actual flight is modified by the effects of the wind. If an uncommanded right yaw occurs in flight, it may be because the wind reduced the tail rotor effective thrust. f. The wind can also add to the anti-torque system thrust. In this case, the helicopter will react with an uncommanded. left yaw. The wind can and will cause anti-torque system thrust variations to occur. Certain relative wind directions are more likely to cause tail rotor thrust variations than others. These relative wind directions or regions form an LTE conducive environment. CONDITIONS UNDER WHICH LTE MAY OCCUR. a. Any maneuver which requires the pilot to operate in a high-power, low-airspeed environment with a left crosswind or tailwind creates an environment where unanticipated right yaw may occur. b. There is greater susceptibility for LTE in right turns. This is especially true during flight at low airspeed since the pilot may not be able to stop rotation. The helicopter will attempt to yaw to the right. Correct and timely pilot response to an uncommanded right yaw is critical. The yaw is usually correctable if additional left pedal is applied immediately. If the response is incorrect or slow, the yaw rate may rapidly increase to a point where recovery is not possible. c. Computer simulation has shown that if the pilot delays in reversing the pedal control position when proceeding from a left crosswind situation (where a lot of right pedal is required due to the sideslip) to downwind, control would be lost, and the aircraft would rotate more than 360° before stopping. d. The pilot must anticipate these variations, concentrate on flying the aircraft, and not allow a yaw rate to build. Caution should be exercised when executing right turns under conditions conducive to LTE. a. Extensive flight and wind tunnel tests have been conducted by aircraft manufacturers. These tests have identified four relative wind azimuth regions and resultant aircraft characteristics that can, either singularly or in combination, create an LTE conducive environment capable of adversely affecting aircraft controllability. One direct result of these tests is that flight operations in the low speed flight regime dramatically increase the pilot's workload. b. Although specific wind azimuths are identified for each region, the pilot should be aware that the azimuths shift depending on the ambient conditions. The regions do overlap. The most pronounced thrust variations occur in these overlapping areas. c. These characteristics are present only at airspeeds less than 30 knots and apply to all single rotor helicopters. Flight test data has verified that the tail rotor does not stall during this period. (a) Winds at velocities of about 10 to 30 knots from the left front will cause the main rotor vortex to be blown into the tail rotor by the relative wind. 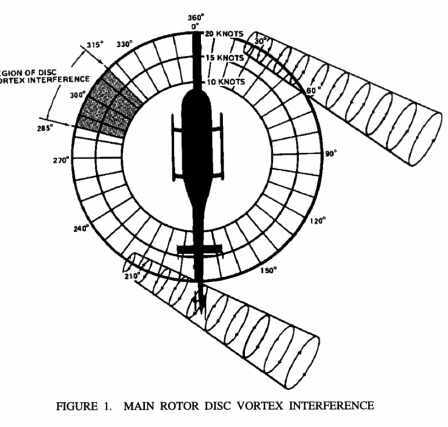 The effect of this main rotor disc vortex is to cause the tail rotor to operate in an extremely turbulent environment. (b) During a right turn, the tail rotor will experience a reduction of thrust as it comes into the area of the main rotor disc vortex. The reduction in tail rotor thrust comes from the air flow changes experienced at the tail rotor as the main rotor disc vortex moves across the tail rotor disc. The effect of this main rotor disc vortex is to increase the angle of attack of the tail rotor blades (increase thrust). (c) The increase in the angle of attack requires the pilot to add right pedal (reduce thrust) to maintain the same rate of turn. (d) As the main rotor vortex passes the tail rotor, the tail rotor angle of attack is reduced. The reduction in the angle of attack causes a reduction in thrust and a right yaw acceleration begins. This acceleration can be surprising, since the pilot was previously adding right pedal to maintain the right turn rate. (e) This thrust reduction will occur suddenly and, if uncorrected, will develop into an uncontrollable rapid rotation about the mast. When operating within this region, the pilot must be aware that the reduction in tail rotor thrust can happen quite suddenly and the pilot must be prepared to react quickly and counter that reduction with additional left pedal input. (a) Tailwinds from 120° to 240°, like left crosswinds, will cause a high pilot workload. The most significant characteristic of tailwinds is that they are a yaw rate accelerator. Winds within this region will attempt to weathervane the nose of the aircraft into the relative wind. This characteristic comes from the fuselage and vertical fin. (b) The helicopter will make a slow uncommanded turn either to the right or left depending upon the exact wind direction unless a resisting pedal input is made. If a yaw rate has been established in either direction, it will be accelerated in the same direction when the relative winds enter the 120° to 240° area unless corrective pedal action is made. (c) If the pilot allows a right yaw rate to develop and the tail of the helicopter moves into this region, the yaw rate can accelerate rapidly. It is imperative that the pilot maintain positive control of the yaw rate and devote full attention to flying the aircraft when operating in a downwind condition. (d) The helicopter can be operated safely in the above relative wind regions if proper attention is given to maintaining control. 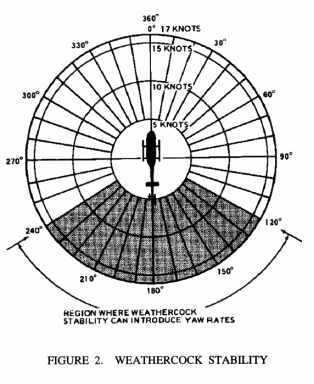 If the pilot is inattentive for some reason and a right yaw rate is initiated in one of the above relative wind regions, the yaw rate may increase. (a) Winds within this region will result in the development of the vortex ring state of the tail rotor. As the inflow passes through the tail rotor, it creates a tail rotor thrust to the left. A left crosswind will oppose this tail rotor thrust. This causes the vortex ring state to form, which causes a nonuniform, unsteady flow into the tail rotor. 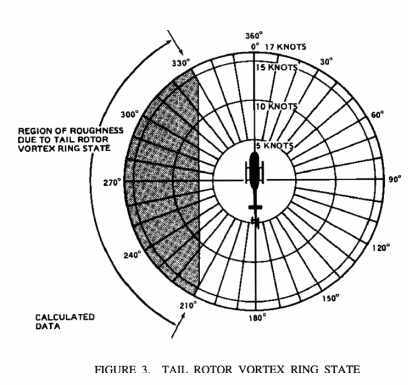 The vortex ring state causes tail rotor thrust variations which result in yaw deviations. The net effect of the unsteady flow is an oscillation of tail rotor thrust. This is why rapid and continuous pedal movements are necessary when hovering in left crosswind. (c) The resulting high pedal workload in the tail rotor vortex ring state is well known and helicopters are operated routinely in this region. This characteristic presents no significant problem unless corrective action is delayed. (d) When the thrust being generated is less than the thrust required, the helicopter will yaw to the right. When hovering in left crosswinds, the pilot must concentrate on smooth pedal coordination and not allow an uncontrolled right yaw to develop. (e) If a right yaw rate is allowed to build, the helicopter can rotate into the wind azimuth region where weathercock stability will then accelerate the right turn rate. Pilot workload during vortex ring state will be high. A right yaw rate should not be allowed to increase. (4) Loss of translational lift (all azimuths). (a) The loss of translational lift results in increased power demand and additional anti-torque requirements. (b) This characteristic is most significant when operating at or near maximum power and is associated with LTE for two reasons. First, if the pilot's attention is diverted as a result of an increasing right yaw rate, the pilot may not recognize that relative headwind is being lost and hence, translational lift is reduced. Second, if the pilot does not maintain airspeed while making a right downwind turn, the aircraft can experience an accelerated right yaw rate as the power demand increases and the aircraft develops a sink rate. Insufficient pilot attention to wind direction and velocity can lead to an unexpected loss of translational lift. When operating at or near maximum power, this increased power demand could result in a decrease in rotor rpm. (c) The pilot must continually consider aircraft heading, ground track, and apparent ground speed, all of which contribute to wind drift and airspeed sensations. Allowing the helicopter to drift over the ground with the wind results in a loss of relative wind speed and a corresponding decrease in the translational lift. Any reduction in the translational lift will result in an increase in power demand and anti-torque requirements. a. Gross Weight and Density Altitude. An increase in either of these factors will decrease the power margin between the maximum power available and the power required to hover. The pilot should conduct low-level, low-airspeed maneuvers with minimum weight. b. Low Indicated Airspeed. At airspeeds below translational lift, the tail rotor is required to produce nearly 100 percent of the directional control. If the required amount of tail rotor thrust is not available for any reason, the aircraft will yaw to the right. c. Power Droop. A rapid power application may cause a transient power droop to occur. Any decrease in main rotor rpm will cause a corresponding decrease in tail rotor thrust. The pilot must anticipate this and apply additional left pedal to counter the main rotor torque. All power demands should be made as smoothly as possible to minimize the effect of the power droop. REDUCING THE ONSET OF LTE. a. Ensure that the tail rotor is rigged in accordance with the maintenance manual. b. Maintain maximum power-on rotor rpm. If the main rotor rpm is allowed to decrease, the antitorque thrust available is decreased proportionally. (1) Avoid tailwinds. If loss of translational lift occurs, it will result in an increased high power demand and an additional anti-torque requirement. (2) Avoid out of ground effect (OGE) hover and high power demand situations, such as lowspeed downwind turns. (3) Be especially aware of wind direction and velocity when hovering in winds of about 8-12 knots (especially OGE). There are no strong indicators to the pilot of a reduction of translational lift. A loss of translational lift results in an unexpected high power demand and an increased anti-torque requirement. (4) Be aware that if a considerable amount of left pedal is being maintained, a sufficient amount of left pedal may not be available to counteract an unanticipated right yaw. (5) Be alert to changing aircraft flight and wind conditions which may be experienced when flying along ridge lines and around buildings. (6) Stay vigilant to power and wind conditions. a. The various wind directions can cause significantly differing rates of turn for a given pedal position. The most important principle for the pilot to remember is that the tail rotor is not stalled. The corrective action is to apply pedal opposite to the direction of the turn. b. Avoiding LTE may best be accomplished by pilots being knowledgable and avoiding conditions which are conducive to LTE. Appropriate and timely response is essential and critical. c. By maintaining an acute awareness of wind and its effect upon the aircraft, the pilot can significantly reduce LTE exposure.